ZTE Quartz smartwatch announced with 1.4" display, Android Wear 2.0 and Google Assistant. ZTE today announced its first wearable device in the US - the ZTE Quartz connected smartwatch. Available exclusively at T-Mobile, the ZTE Quartz brings an always connected experience with cellular, Wi-Fi and Bluetooth connectivity. Available on TMobile.com beginning Friday, April 14 and in select T-Mobile stores beginning Friday, April 21 for $192. 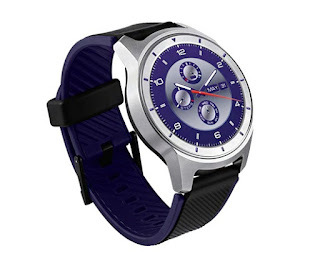 Powered by Google Android Wear 2.0 and the Qualcomm Snapdragon Wear 2100 (Dual-core 1.1 GHz) platform, the ZTE Quartz smartwatch can make calls, send and receive texts, share on social media, get directions, stream music, and so much more without always having to carry their smartphone. Connectivity: You can make calls, text and stay connected virtually anywhere, all from your watch utilizing T-Mobile's network. Long Battery Life: Fitted with a large 500mAh battery, the Quartz allows consumers to enjoy the smartwatch anytime without having to worry about running out of battery. Customization at Your Fingers: With interchangeable wrist bands and customizable watch faces, consumers can proudly wear the smartwatch whether they are dressing up or dressing down. Crisp Display: The 1.4" AMOLED display, along with Gorilla Glass 3, delivers a vivid viewing experience no matter where you are. Flexibility: The smartwatch can be used as a companion to your smartphone or as a standalone wearable device with the ability to make calls right from your wrist. Android Wear 2.0: Google's newest Android Wear OS comes standard on the ZTE Quartz with the most up-to-date notifications, range of watch faces and applications, and Google Assistant features. Snapdragon Wear 2100: The smartwatch takes advantage of Qualcomm Technologies' advanced Snapdragon Wear 2100 platform which is designed specifically to meet the demanding size and battery life requirements of a compact smartwatch while delivering a smart, super-responsive, and virtually always-connected experience.